There are myriad theories and definitions when it comes to Interior Designing. But we can safely conclude on one fact: Interior Designing is both an art and science. Interior Designing is art because using it, we are striving to achieve a more aesthetic and pleasing environment of a home décor or a commercial space. Interior designing is science because we are attempting to enhance the interiors of a space, or a building using the rules of architecture and the mathematics of projectiles and angles. When experts asked interior designing students about what they think it is, then the most common replies can summarized this way: playing with colors, shades, temperaments, fabrics and the senses to scoop out the best within an existing structure. But, in reality, interior designing is much, much more than pure decoration of a house or a commercial/public space: It is the way of thinking and creating. Ever since human beings started carving out their own spaces in the form of caves and then huts which diversified into palaces and forts, interior designing has been in existence. Infact, the very art and science of interior designing was inbuilt in the very process of building. As human beings became more refined, they started to carve out even more complex, grand interiors and thus, arose the need of forming a systematic, defined study of the process of building. This way, the art and science of Interior Design was invented, because human beings wanted even more effective and efficient usage of the available space and wanted to impress his own aesthetic senses. Interior Designing In Mythology: Facts or Fiction? If we delve into the oldest civilizations of human race, then we will find traces and evidence of interior designing in almost every corner of the world. If we observe Indian history, then the importance and relevance of Interior Designing and Architecture can be gauged from the fact that there is an exclusive God named Vishwakarma, which is considered as the God of Architecture and Interior Design. According to Rig Veda, Vishwakarma has been defined as a ‘Personification of Creation and Abstract form of the Creator God’. Later on, Brahmins described Vishwakarma as the ‘Principal Architect of the Universe’. Temples, city squares, homes, and even the pyre of sacrifice in Hindu mythology have been proposed to be designed as per the science of interior designing, which has been propagated by Vishwakarma. If we dig into the Egyptian mythology, then we will find that Interior Designing has always been one of the strongest fundamentals of their culture. For example, the ‘Soul Houses’ which were placed inside the tombs were designed to accept food items, after death. If we observe the architecture of pyramids, then the way various ventilations, porticoes, columns, loggias, windows, and doors were designed, it is very much clear that Interior Designing was considered as one of the most important aspects of architecture. Stay tuned with Kataak.com, as we explore even more finer details of Interior Designing, and extract some hidden facts which you were not aware earlier. 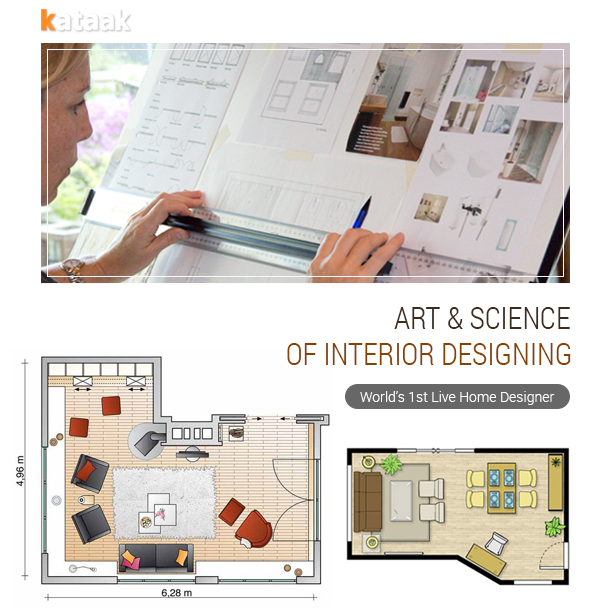 Visit Kataak.com – World’s 1st Live Home Designer to design your own interiors, your own way! She studied Instrumentation engineering but found her soulmate in writing. When not scribbling, you can find her drinking tea and talking all around the office.